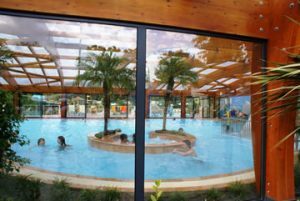 Next stop – 15 nights at Camping Du Letty in Benodet. 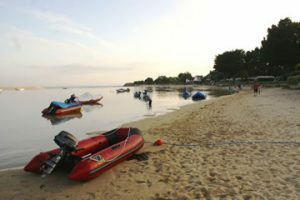 We left Camping Port La Chaine early on the morning of Tuesday 9 August to travel on to our next campsite, Camping Du Letty in Benodet in southern Brittany. Du Letty was the site we had stayed at on our first camping visit to France in 1994 when our children were young. We all loved the site and our children never wanted to go anywhere else so in the 90’s/early 00’s, we visited Du Letty for a number of consecutive summers. We were initially ‘tenters’ with a large frame tent before we “graduated” later to being caravanners. We had booked a pitch at Du Letty for 15 nights. We were looking forward to our return visit AND to trying out their new water park!! 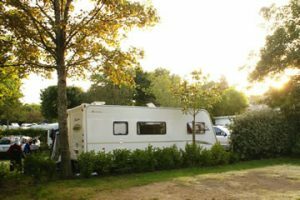 Our previous review of this site was the first one on UKCS and a number of folk commented how our very positive original review had encouraged them to try Camping Du Letty – It’s a pity we’re not on commission for our recommendation! Our last previous visit had been in 2003. We took the D20 through Pleubian to join the D786 near Treguier. We drove west towards Morlaix. The route near Plestin-les-Greves was along the coast and very scenic. We bypassed to the north of Morlaix before turning onto the D785 southwards. We knew this part of the route well as it was the one that we had used in the past travelling between Benodet and Brittany Ferries at the port of Roscoff. The D785 is a beautifully scenic route over the high moorlands in the centre of Brittany. From near the Montaigne de St Michel there are lovely distant views over the valley and Reservoir de St Michel below. The road is a good quality single carriageway (in both directions) although a few picnic places enroute would be good as we were looked, unsuccessfully, for somewhere to stop and eat our picnic lunch. Our route passed through the centre of the pretty small town of Brasparts. (A name which always caused much amusement to our children) Soon after Pleyben we turned west onto the N164. After a short distance we turned south onto the N165/E60 near Chateaulin. This dual carriageway took us to the northern outskirts of Quimper and we bypassed the city on its western and southern sides. We then joined the D34 to Benodet a route which we, again, recognised from previous visits. On reaching the roundabout adjacent to the Carrefour store on the outskirts of Benodet we turned left, to avoid the town centre, and followed minor roads to the gates of Camping Du Letty. We noticed that there had been a considerable amount of residential development since our previous visit 8 years before. There were, also, new-to-us “traffic calming” measures including “speed bumps” which had be carefully negotiated, particularly whilst towing. 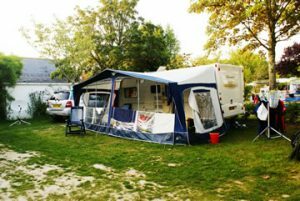 We arrived at Camping Du Letty in the early afternoon having travelled 115 miles from our previous site at Camping Port La Chaine. We had booked our pitch in May and asked for a pitch as near to the sea as possible. On arrival we were given a warm welcome by the English speaking staff but the pitch we were directed to, on the pitching “paddock” Les Bruyeres 10, was a long way from the beach and the sea. We did move our ‘van onto the pitch but after further consideration we returned to Reception and asked if there was nothing nearer to the beach. We were offered a pitch only slightly nearer to the beach but after inspecting this we returned again to reception and spoke with the Manageress Madame Christine Benois-Guyader. She was very assertive and at first insisted that there was nothing available nearer to the beach, complaining that everyone wanted a pitch near the beach. I, however, persisted and in the end was offered a pitch on Les Chardons Bleus which was right behind the new water park complex and much closer to both the beach and Reception. We gratefully accepted this pitch. Our change of pitch was did not go entirely without a hitch (excuse the pun) as we had problems with our Jockey wheel jamming which meant that we could not unhitch the ‘van and left our outfit blocking the main road through the campsite. The turns from this site road into the pitching areas are very tight and it was necessary to unhitch the ‘van from the car to move it in with the motor mover. A number of other campers came to our assistance and we got the ‘van onto our new pitch. Our problems were not, however, over completely even then as the extended use of the motor mover meant that the caravan battery was becoming rather flat. This in turn meant that the mover struggled to get the ‘van onto a levelling ramp with the tyre slipping against the rollers of the motor mover. Too late I realised that the slipping rollers had damaged the treads of the, almost brand new, caravan tyres. I was a little concerned about the damage to the tyre tread and so when we had positioned the ‘van we phoned the Caravan Club’s “Red Pennant” Insurance service, our travel insurers, for advice. The “Red Pennant” staff erred on the side of caution and were all for us getting both of the tyres replaced. Knowing, however, from previous experience, the difficulty in sourcing the correct tyres in France I consulted with “Tyrecare St Helens”, our tyre fitting company, who deal with all our tyre needs back home in St Helens. Stan and his son Jon who run “Tyrecare St Helens” were wonderful. At their suggestion I emailed them photos of the tyre damage. In a 3 way conference between us, the “Red Pennant” advisor” and Stan of “Tyrecare”, Stan insisted that the tyres were okay and that the damage to the tread was no more severe than that on many vehicles. Reassured by Stan’s advice we decided not to change the tyres. At the suggestion of “Red Pennant” I asked Du Letty’s Madame Christine’s advice on finding a caravan dealer to, also, check the tyres. Christine was, as always, very helpful and arranged for Monsieur Phillipe who hires out caravans at Du Letty to come and check out the tyres on our pitch. Monsieur Phillipe has the additional experience of being a retired Gendarme. With the translation assistance of his wife, only she spoke a little English, Phillipe, also, assured us that the tyres did NOT need replacing. The advice we received was obviously sound as we have continued to use them these tyres to return to our home in the UK and for a good many miles of touring subsequently. We rewarded Stan and Jon with a couple of bottles of French Cider on our return home. The “paddock” on which our pitch was located was only big enough for 2 pitches and alongside the main roadway through the site. The pitch was on slightly sandy grass and with some shade from the hedges and mature trees. Unfortunately the drinking water taps for our “paddock” were on the opposite side to our pitch so we were unable to use our water connection hose for a direct supply, although many other pitches do have access to their “own” tap. There was a drain for ‘grey’ waste water adjacent to our ‘van. Our pitch was plenty large enough for our ‘van, awning and Kia Sorento. After a LOT of repositioning the dish I was able to get a good signal on our satellite TV system – it was hard to avoid the trees which tended to obstruct the single. We were, also, able to access the site’s free wi-fi from our caravan. The free wi-fi coverage is said to extend to most of the pitches. We found Du Letty much busier than in previous years. Even at the end of August when we were leaving there were still English folk arriving. In previous years the site would have been quietening down after the French children had returned to School. In addition there were a lot more English guests staying generally. I think the new pool complex was a big factor in this increased popularity. Some people we chatted to bemoaned these changes but we found Du Letty an excellent and even improved site. The site’s new pool complex is wonderful. The indoor pool has a uniform depth of approximately 1.5mt with a Jacuzzi and several other fun features. The water was pleasantly warm and the pool area very well appointed with lovely surrounds with ornate tiling and a range of tropical plants. The outdoor pool is well designed too with slides and a number of other features. There are lots of sun loungers. All these pool facilities are included in the pitch price. It is necessary to have a rubber wrist band to use the pools and these are available at Reception for a 10€ deposit which is refunded on their return. The pool changing area has toilet and shower facilities and changing cubicles. There are, also, key operated lockers which require a, refunded, € coin. The bar near reception has been extended with an outdoor patio which overlooks the pool complex. Nearby there is the camp mini-market which sells a good range of food and drink and newspapers. There is, also, a food take-away which serves a range of food (including fish and chips!) but we did not use this facility. There is, also, another bar “L’Amiral” situated near the campsite entrance where there are sometimes discotheques and live musical entertainment. In addition near to Reception there is a very comfortably furnished library which, also, has 4 computers which can be rented on an hourly basis. There is a laundry equipped with several washing machines and tumble driers operated by tokens which can be bought from reception. The site has an excellent range of sporting facilities. There are outdoor hard tennis courts, an indoor squash court and several table tennis tables both indoor and outdoor. There is, also, a well-equipped gym which can be used without charge. Other activities such as archery are organised during the peak season. For those seeking relaxation there is a Relax Area with hot tubs, saunas, steam baths and a massage room. There are, also, children’s activities but I don’t have any details of these. As I’m writing for an English audience I better mention the toilets! There are 5 sanitary blocks located around the campsite. These are some of the best I have seen on any campsite. The fully tiled, blocks are modern and extremely well-appointed with individual cubicles with wash basins and both English (seated) and Continental toilets. The hot showers require a token which has to be purchased from reception. These blocks, also, contain dedicated baby bathrooms. One block even has a 2 dog showers. I used one to shower collie Max but he was NOT impressed as he was not fond of water at all!! All of these toilet blocks are kept extremely clean by very frequent cleaning. There is a, also, a room with full size hairdryers. There are a chemical disposal points in small rooms at each sanitary block. Each CDP is well designed with a Continental toilet and a tap fitted with an appropriate length hose for rinsing. Madame Christine and her staff, who all speak excellent English, were all very helpful throughout our stay. Christie helped me find a supplier for some satellite accessories and arranged for Monsieur Phillipe to check with our caravan tyres. When there was a problem with the site wi-fi Madame Christine gave me a complimentary hour on one of the ‘pay’ PCs in the campsite’s library. Le Letty beach is adjacent to the site, and with direct access, was much the same as we had found it previously. The sand is very coarse but the beach was less crowded than on previous visits, probably because of the swimming pool complex. The water in the small river adjacent to the site varies from a shallow stream to a fast running torrent depending upon the state of the tide. The water temperature is warmer than the open sea at the mouth of the river. We spent several days lounging on the beach. We, also, swam and snorkelled in the river when the tide was quite low, although we did “cheat” and wore our wet suits for this. There is a bathing platform anchored in the river. Across the river from the site there is the Mer Blanche a very long sand bar with the open sea on the far side. The Mer Blanche can be reached by crossing the river and a lot of campers cross to this bar as the sand is less coarse. It is important to choose one’s crossing time for when the river is low or otherwise a boat or swim is necessary. As always campers had lots of boats moored in the river ranging from small inflatables to largish motor cruisers. We inflated our 3 metre Zodiac and moored it out on the river. (We had originally bought this second hand from a French camper at Du Letty about 12 years ago!) We used our boat several times for trips along the river and out into the sea beyond the river mouth. The sea just out of the river mouth is ideal for sailing, windsurfing, etc. Kayaks are available for hire from Monsieur Philippe who has a base near reception. (He, also, hires out full size fridges). Header banner image credit to Karsten Wentink [CC BY-SA 4.0 (https://creativecommons.org/licenses/by-sa/4.0)], from Wikimedia Commons.